Track and log application usage. Is there a better alternative to AppTracker? Is AppTracker really the best app in Desktop category? Will AppTracker work good on macOS 10.13.4? 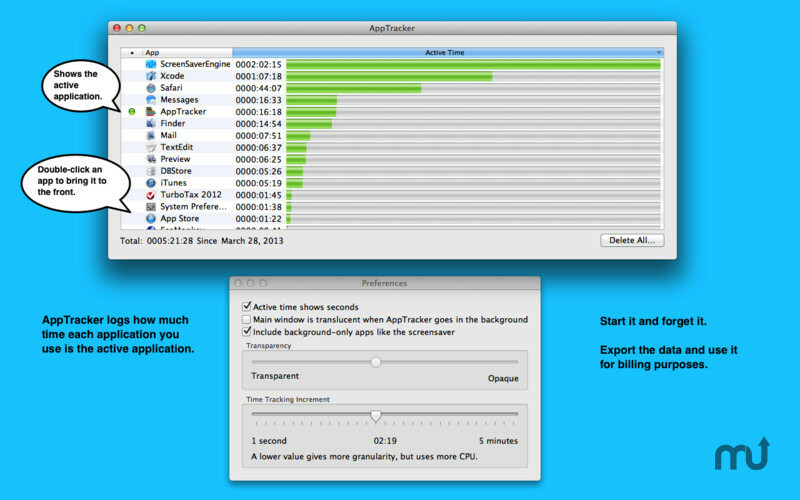 AppTracker tracks and logs the active application (in front of all other applications) while you use your Mac. Start it and forget it! Active time graph shows how long each application has been the active application. Use it for billing purposes. Export the data as tab-delimited. Set the main window to be translucent when it goes into the background so it won't be in your way. Easily clear the display by clicking the Delete All button. AppTracker needs a review. Be the first to review this app and get the discussion started! AppTracker needs a rating. Be the first to rate this app and get the discussion started!